Now, we advocate getting broccoli into your diet but this can be pretty monotonous if we don’t jazz it up somehow. You can easily make it more exciting by including other veggies, such as mushrooms. You can also create an interesting textural and temperature contrast by adding creamy cool chicken salad and a crisp, juicy sliced tomato. We are huge fans of the Rhode Island Chicken Salad which is a signature of the Brown University cafeteria, the Ratty (compare to the classic Waldorf Chicken Salad). If you want to recreate this chicken salad, simply add freshly diced apples, halved grapes, raisins, and celery to your standard chicken salad. In this particular presentation, the bright red of the tomato contrasts stunningly with the vibrant green of the perfectly cooked broccoli, inviting your taste buds to savor the dish before you. Put broccoli and mushrooms on a plate, and cover with another plate. Steam on high power in the microwave for 80-90 seconds, until broccoli is just barely cooked through (you don’t want mushy broccoli, do you?). Top with shredded cheese, and microwave, uncovered, for 30 seconds to just melt the cheese. 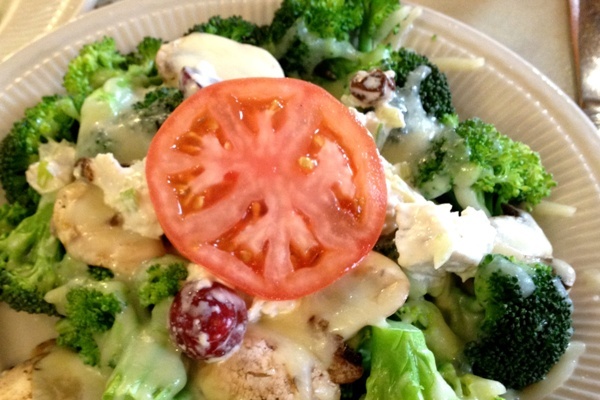 Put a dollop of chicken salad on top, and garnish with a beautiful slice of tomato.